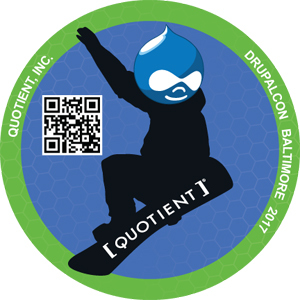 Visit Quotient at DrupalCon April 24-28 Booth #125 | Quotient Inc.
Quotient is incredibly excited to be attending Baltimore Drupalcon, April 24-28 at the Baltimore Convention Center. Quotient will have a booth (look for the snowboarder!) and will be presenting a session on "Bodiless Drupal" on Wednesday at 10:45 in room 317. Stop by booth #125 for some neat swag and training materials. We've also packaged the "Zero to Drupal" training program for any communities that would like to steal that and run with it.